LOS ANGELES — On what would have been Marvin Gaye’s 80th birthday, the U.S. Postal Service today honored the music legend with the dedication of a new commemorative Forever stamp during a first-day-of-issue ceremony at the Greek Theatre, where he once performed. Barksdale was joined by Berry Gordy, founder of Motown Records; Mary Wilson, member of The Supremes and program emcee; Smokey Robinson, singer, songwriter and Motown executive; Kadir Nelson, stamp artist and author; and Kenny Lattimore, classical, jazz and gospel singer. Also, members of the Gaye family — son Marvin Gaye III, daughter Nona Gaye, sister Zeola Gaye and brother Antwaun Gay — participated in the stamp’s unveiling. 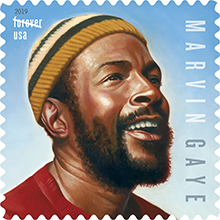 The Marvin Gaye Forever stamp is the ninth in the Postal Service’s Music Icons stamp series. Other honorees in the series are Ray Charles, Lydia Mendoza, Johnny Cash, Jimi Hendrix, Janis Joplin, Elvis Presley, Sarah Vaughan and John Lennon. Gaye was one of the most influential music performers of his generation. He helped shape the buoyant sound of the Motown record label in the 1960s and broaden the scope of R&B music in the 1970s. Released in 1971, his expansive masterwork, “What’s Going On,” is widely considered one of the greatest recordings in the history of American popular music. 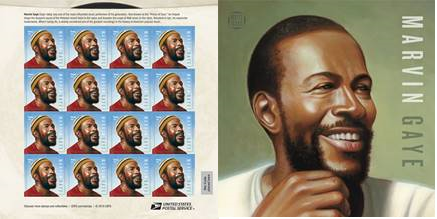 The artwork for this stamp features a portrait of Marvin Gaye inspired by historic photographs. Gaye’s name appears vertically on the right side of the stamp. “USA” and the Forever denomination are in the top left. The stamp pane is designed to resemble a vintage 45-rpm record sleeve. One side of the pane includes the stamps and brief text about Gaye’s legacy, with the image of a sliver of a record seeming to peek out the top of the sleeve. Another portrait of Gaye, also inspired by historic photographs, appears on the reverse along with the Music Icons series logo. Art director Derry Noyes worked on the stamp pane with artist Kadir Nelson. In response to the stamp, members of the Gaye family offered the following comments. The Marvin Gaye stamp is being issued as a Forever stamp. This Forever stamp will always be equal in value to the current First-Class Mail 1-ounce price. News of the stamp is being shared on social media using the hashtags #MarvinGayeStamp and #MusicIcons. Followers of the Postal Service’s Facebook page can view a recording of the ceremony at facebook.com/USPS. Customers may purchase stamps and other philatelic products through the Postal Store at usps.com/shop, by calling 800-STAMP24 (800-782-6724), by mail through USA Philatelic or at Post Office locations nationwide.